Does this look familiar to our 33-Stanyan (er, 33-Ashbury/18th) regulars? 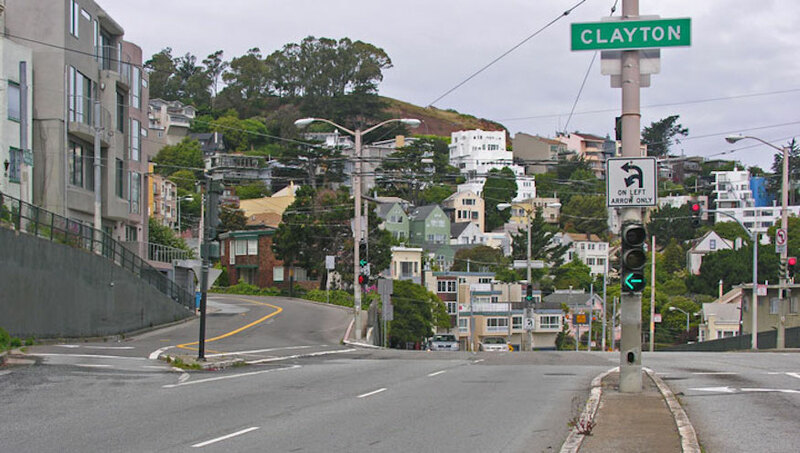 This sharp turn from Clayton to Market was not negotiable by early streetcars so operators would “switch” the backs of the passenger seats at Market Street, thereby “switching” the streetcar in the reverse direction. Thanks to reader Robert Holt for the tip. Ever heard of Muni’s 1-Sutter? The 33 Line is one of the oldest streetcar lines in the city, having been built as 18th and Park branch of the San Francisco & San Mateo Railway in 1894. (The railway later became part of the Market St. Ry. which was absorbed into Muni in 1944.) 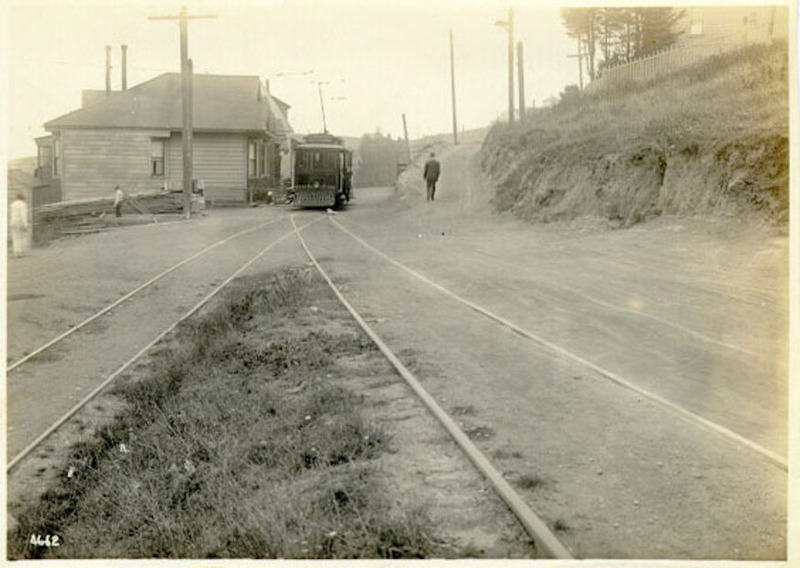 The streetcars used on this line had bench seats that ran along the walls (longitudinal or “bowling alley” seats) so no one had to sit backwards. In 1935, the Market St. Ry. 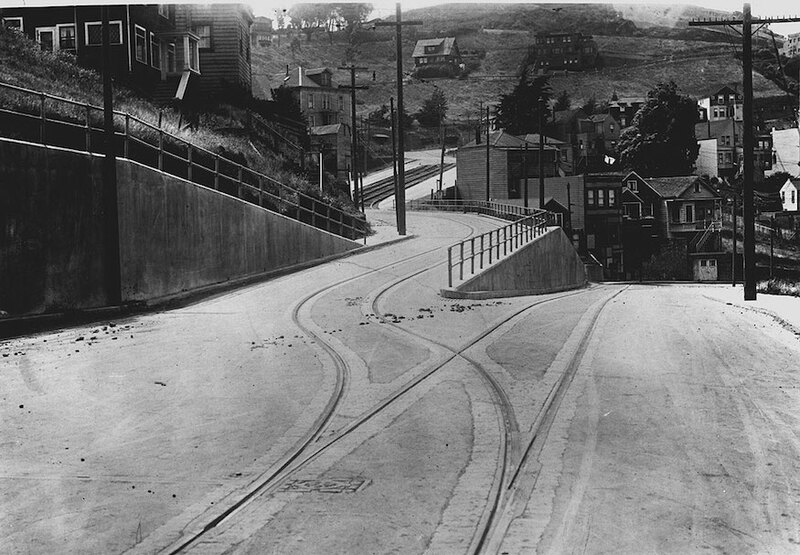 converted the 33 to trolley coach (first in the city), producing the famous hairpin turn at Market & Clayton. Over time the road has changed a lot. Before it was a deserted road, now houses had sprung up and become a modern street. It is the way we are looking into.